Secrets Resorts and Spas won the Crystal Award for "Best Hotel Chain" by Apple Vacations. BOOK YOUR SECRETS RESORT VACATION ONLINE TODAY! Secrets Resorts & Spas in Riviera Maya offer adults an extra measure of romance and sensuality in exquisite luxury settings. Immerse yourself in Unlimited-Luxury™ where everything is included: Elegantly appointed rooms and suites with 24-hour concierge and room services. Multiple gourmet restaurants and lounges serving premium beverages. Endless day and evening activities, all in spectacular settings. Unlimited-Luxury™. A new and better way to have it all. VOTED ONE OF THE TOP 10 BEST BEACHES IN THE WORLD! Unveiling the newest additional to Unlimited-Luxury: Secrets Maroma Riviera Cancun. 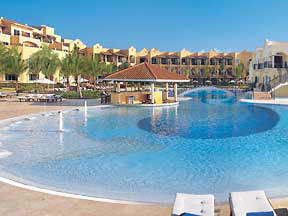 Secrets Maroma Riviera Cancun offers adults an extra measure of romance and sensuality in an exquisite luxury setting. Immerse yourself in Unlimited-Luxury where everything is included! Elegantly appointed rooms and suites with 24-hour concierge and room service, multiple gourmet restaurants and lounges serving premium beverages, endless day and evening activities and all in a spectacular setting on one of the best beaches in the world! This adults-only, all-suite resort features 433 suites, all with spectacular views of the sparkling ocean or the unique Mexican landscape. Each room offers 24-hour room service, internet access, an MP3 player docking station, and more. Preferred club suites are enhanced by a private lounge and pool area. SECRETS CAPRI RIVIERA CANCUN RESORT & SPA is perfectly placed on the Mexican Riviera and delivering every amenity you could desire, Secrets Capri Resort & Spa promises a vacation you’ll never forget. Combining traditional colonial hospitality, luxury accommodations and world-class services, Secrets Capri sets the standards by which other resorts are judged. A proud member of Preferred Hotels® and Resorts Worldwide, Secrets Capri Resort & Spa offers discerning travelers the elegant experience they demand in a place of breathtaking beauty. Secrets Sanctuary Cap Cana, is located just outside Punta Cana in what has been hailed as the World’s Greatest New Resort Destination - Cap Cana. Secrets Sanctuary Cap Cana, the quintessential luxury resort with sugar white-sand beaches and crystal clear waters of the Caribbean. Just a quick 15 minutes from Punta Cana International Airport— this beautiful Spanish Colonial style resort has 175 suites and villas within an adults-only, round-the-clock playground; together with the exclusive Unlimited-Luxury® privileges that set Secrets Sanctuary Cap Cana apart. Not to mention, a concierge at your service 24 hours a day. Ideally located in Montego Bay, Jamaica, Secrets Wild Orchid Montego Bay, an adults-only resort, will feature 350 opulent suites. Of all your vacation memories, Secrets Wild Orchid will be your most treasured. Based on our reputation for exceptional quality and services, the two properties of Secrets St. James and Secrets Wild Orchid have already been recognized by Preferred Hotels & Resorts Worldwide for inclusion among the finest full-service resorts and spas. Secrets St. James features a British colonial air creating a contemporary yet conservative experience, while Secrets Wild Orchid Montego Bay takes its inspiration from the island surroundings with warm neutral tones and unique indigenous art. Prepared to be awed from the moment you arrive at this lavish resort featuring numerous gourmet à la carte restaurants, bars and lounges, a lavish spa with oceanfront massage cabanas, concierge service state-of-the-art open-air theatre, a full array of activities and championship golf courses nearby.